In the bad old days of web two dot 0, I had a blog called Yoshi, Etcetera. Don’t search for it — it’s long gone. I was a lot younger, and wrote about my ratty underwear, and America’s Next Top Model, and my cat, Yoshi. I had a decent amount of readers. There weren’t a lot of blogs back then. Now I am a mother and a wife and a (hopefully better) writer. My more literary stuff is here. One of the best moments of my life (after having my baby, getting married etcetera) was getting published in PANK magazine. I wrote a few novels. I’m still working on one of them. On this blog you’ll find stuff about my baby, and my husband, and my even-rattier underwear (maybe). 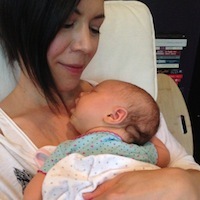 There are so, so many great blogs now, especially ones about being a parent. All that to say: thanks so much for visiting. I’m really glad you did.